We knew we needed to tackle some roof repair about a month after moving into our house; we had some minor leaking in the bedroom after a major rainstorm. Since the initial discovery, that spot has been patched twice, but continues to find new ways to let in the rain and snow. Teague’s been up-close and personal with the outer roof plenty of times, but looking at the inner portion is actually quite a bit harder. To find out the true extent of our roof problems (namely, how much of the original decking had been ruined by these leaks) we had to climb up into the crawl-space above the second floor. And the only way to get into this space is through what used to be the stairwell to the cupola, and what is now a bedroom closet. For those who don’t know what a cupola is, it’s that little boxy thing with windows that sits on top of our house. I have yet to snap an exterior photo that does it much justice, but maybe this spring I will finally get around to it. Our cupola has 8 double-hung arched windows, 2 per side. It’s about 8’x8′ inside, and would make a lovely artist’s studio or secret hideout someday when it has a stairwell leading up to it, and perhaps a floor to stand on. Right now, it’s pretty much gutted. We have explored the cupola before, but never in daylight or nice weather. It’s a much different experience! 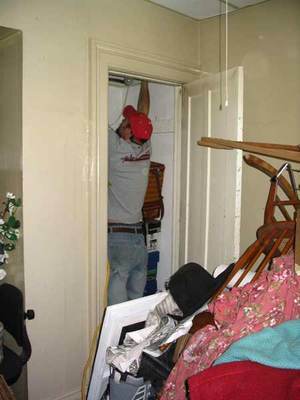 Here’s Teague climbing into the closet (which happens to be in our storage room, hence the total mess) – he’ll be hoisting himself up through a hole in the closet ceiling. You can see why we don’t get in the cupola often…. This is what it looks like from the opposite side – that’s the whole in the closet ceiling, and what’s left of the old stairwell ceiling/walls. The white board is what we stand on so as not to fall through the ceiling. And here is best view of the cupola innards I could get. It’s taken with the camera down on the floor, facing up. You can see the ceiling and arched windows, plus about 100 years worth of cobwebs. All 4 sides of the cupola had been boarded up due to broken window panes (3 out of 8, not bad! ), but Teague recently took one of the sides off which is why one side looks so bright and the others look so yucky. With a little paint, I think this could be my favorite spot in the house. The good news is, the original decking (extremely wide boards – maybe 8″? – laid side by side) is in good shape in most parts, and we can replace the pieces that have rotted using custom-milled lumber. This means no worrying about buying, transporting, and lifting giant sheets of plywood. For once, luck was on our side! I wish I had a cupola. Very neat. So am I to understand that the stairs to the cupola were removed to add a closet? I would have gladly hung my close in the stairs if it meant I had access to the cupola. There is a house in town on a prominent street that has a similar cupola. Every year they put a Christmas Tree up in theirs. I’m not sure why the stairs were removed, but I would have to guess that yes, they swapped them out for a closet. I’m with you – attic/cupola access vs convenient clothes hanging? No contest. The door to the closet matches the rest of the original doors, so I can only speculate that it’s the stairwell door. If so, the stairs were very steep! We’d like to put a circular stairwell in someday….. wouldn’t take up so much space, and it’d be mighty pretty. What might be really cool would be to replace some of the glass with stained glass, and then light it up at night. Also, once you replace the stairs (etc.) that cupola will act as a heat sink (chimney) during the summers if you open the windows and let the breezes force the hot air up and out.